Vacuum bag molding, a refinement of hand lay-up, uses a vacuum to eliminate entrapped air and excess resin. After the lay-up is fabricated on either a male or female mold from precut plies of glass mat or fabric and resin, a nonadhering film of polyvinyl alcohol or nylon is placed over the lay-up and sealed at the mold flange. A vacuum is drawn on the bag formed by the film while the composite is cured at room or elevated temperatures. Compared to hand lay-up, the vacuum method provides higher reinforcement concentrations, better adhesion between layers, and more control over resin/glass ratios. 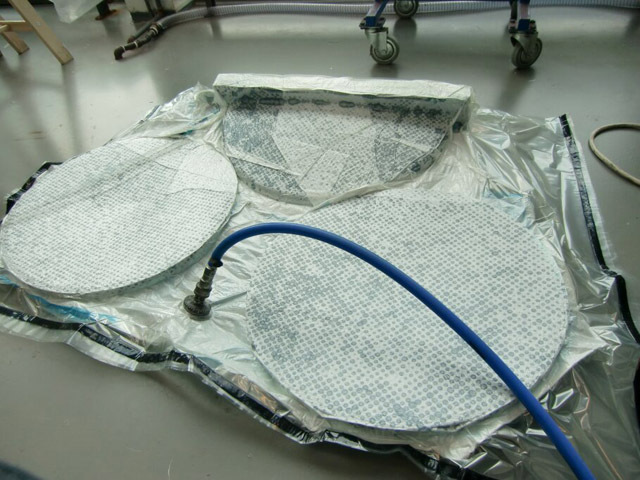 Advanced composite parts utilize this method with preimpregnated fabrics rather than wet lay-up materials and require oven or autoclave cures.